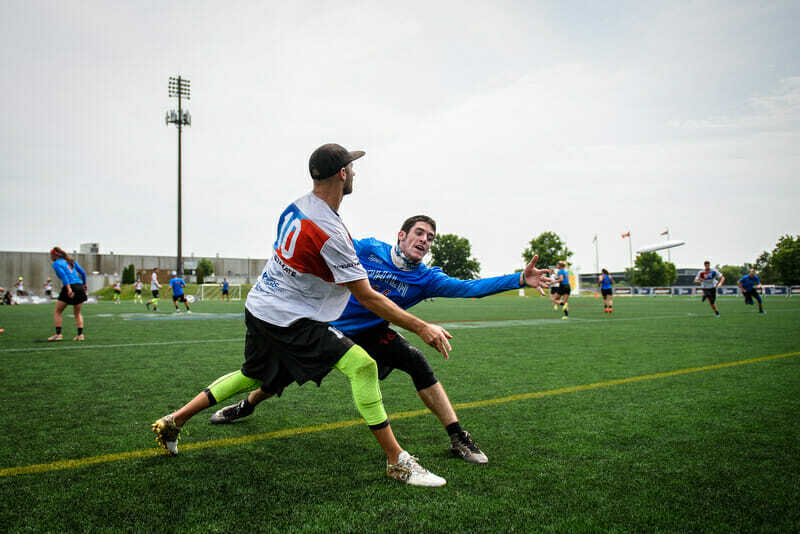 The top five mixed teams in Ultiworld’s Mixed Division Power Rankings clash in Middletown, New York this weekend at the Pro Championships, the final weekend of the 2018 regular season. #1 Philadelphia AMP will look to win a second consecutive tournament championship after defeating #2 Seattle BFG in the U.S. Open Final. #11 Boston Wild Card will play with their 2018 club roster for the first time. And #13 Minneapolis No Touching! will attempt to continue building momentum after a strong showing at Elite-Select Challenge. Earlier this month, Slow White qualified for semifinals at the U.S. Open despite integrating ten new faces to their 2018 club roster for the first time. This weekend, 2016 Mixed Player of the Year Jeff Smith returns. However, the team will be without offensive mainstay Vicki Chang. Slow White will savor the Pro Championships as an opportunity to build chemistry and trust. Captain Hannah Baranes said that Slow white has “been focusing on improving high-pressure person defense [to] have the chance to earn the disc back with blocks.” But teams like Mixtape and Wild Card won’t make it easy; both teams got eliminated by Slow White at Club Worlds and will be looking for a little revenge. Mixtape rebounded from an 0-3 day one at the U.S. Open to finish in 5th place. This weekend, they’ll return offensive stalwart Paige Kercher and defensive stalwart (and 2017 All-Club first teamer) Evan Klein. After disappointing finishes at WUCC and the U.S. Open, the defending national champions need to get back to their winning ways. Mixtape also lucked out by receiving a 9 am bye on Saturday morning, which will smooth out their transition after flying east. Wild Card will suit up their 2018 club roster for the first time. After a well-deserved break after WUCC, the team will continue working on their system and building chemistry for the series. Ian Engler was a rock at Club Worlds, averaging 4.33 points1 over the nine game tournament. Wild Card has suffered heartbreaking elimination losses to Mixtape at 2017 Nationals and Slow White at WUCC; Wild Card may have to avenge one of those losses in order to reach bracket play in this stacked pool. And they’ll have to do so without All-Club second teamer Hailey Alm, who is unavailable this weekend. Rally was a late addition to the tournament field. Thus, they’ll be missing a few players who had previously scheduled arrangements over Labor Day weekend. When the schedule was released, Rally was excited to see themselves a pool alongside four WUCC teams. That will offer a tough challenge, but there’s plenty to play for. A strong weekend may help Rally sneak into strength bid territory, but perhaps more importantly, keep Space Heater (currently 18 points above the bid threshold) above the strength bid line. The entire Mid-Atlantic region will be rooting for Rally. BFG will rebound from their only loss in the 2018 calendar year by playing four out-of-region pool play opponents. With just two players missing this weekend, BFG will focus on growth, valuing the high-quality reps they’ll get in preparation for the club postseason. Rena Kawabata and Kieran Kelly are downfield playmakers and pose matchup problems for everybody. With top-end stars, depth, and a positive recent history (a six goal win over Drag’n Thrust at the U.S. Open), BFG is the clear favorite to finish on top of pool B.
Drag’n Thrust enters the Pro Championships after strong semifinals showings at Pro-Elite Challenge and U.S. Open. The Minneapolis team lives and dies by Sarah Meckstroth and Brian Schoenrock. In their 13-10 U.S. Open semifinal loss to AMP, the duo combined for seven goals, four assists, and five blocks. On Saturday, Drag’n Thurst will get the opportunity to improve on a 14-8 loss to BFG, and almost certainly will match up with at least one WUCC team on Sunday. Another semifinals or better appearance for Drag’n Thrust will cap off a fantastic regular season. No Touching! is grateful to be invited to a tournament with such high-caliber teams. They’re entering the tournament with a “nothing to lose attitude,” as captain Sam Valesano put it. Results wise, No Touching! has impressed this season, combining blowout wins with close losses. Currently in 7th place in the club rankings, the veteran-heavy Minnesota team has the opportunity to earn a strength bid for the first time in team history. 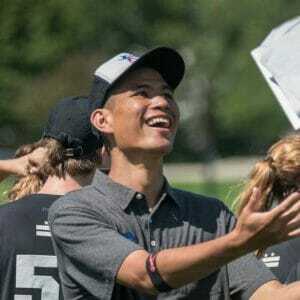 Despite missing seven players from their regular roster, the Sunday morning matchup against city-rival Drag’n Thrust is sure to provide fireworks, offering a taste of North Central Regionals. XIST’s last tournament came three weeks ago at the Chesapeake Open, where they finished a disappointing 9th. However, they will receive a boost from D-Line captains Ryan Drost and Caitlyn Hauswirth, who will both be more available this weekend. Yet the Pro Championships were a last minute addition to the XIST tournament schedule, meaning that the team will be missing five rostered players each day. XIST is excited to play games against the nation’s top teams in their own backyard; they’ll need to play better than they have this season in order to be a player in a competitive Northeast Region. It has been a disaster season for the team that finished in 8th place at 2017 Club Nationals (currently 32nd in the club rankings). Fortunately for Metro North, they’ll roster 27 players for the first time all season. “It’s more about process goals than results for us at this point,” said captain Adam Stern. “We have to make sure we are doing the right things on the field, offensively and defensively.” Echoing the sentiments of some of the other lower seeded teams, it’s clear there’s value in a strong weekend. Such a performance will give Metro North the confidence to spring an upset or two at Northeast Regionals. Remember, this is a team that has finished in the top eight at the Club Championships in each of the three previous years. Comments on "Pro Championships 2018: Tournament Preview (Mixed)"